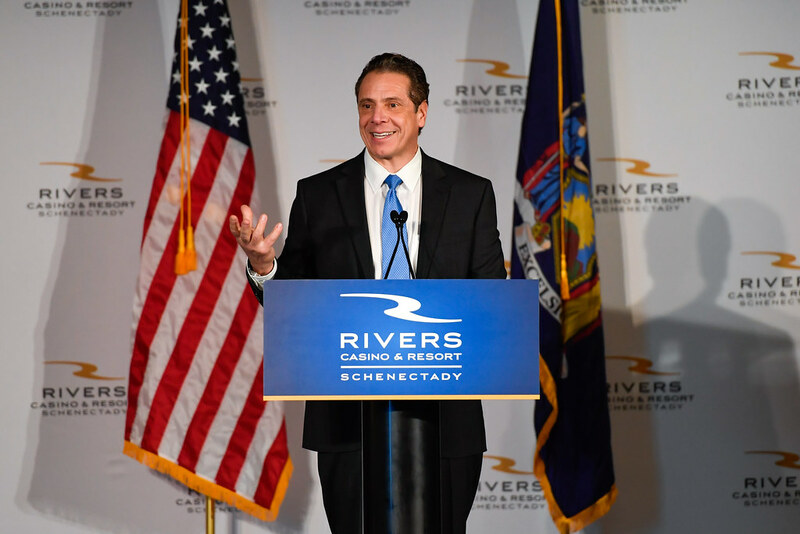 Governor Andrew M. Cuomo today announced the grand opening of the Rivers Casino & Resort in Schenectady. The $330 million resort features a 51,000 square-foot gaming floor, a luxury hotel and multiple dining and retail options as part of a larger Mohawk Harbor Redevelopment project. Rivers has created 1,025 permanent jobs with another 50 expected once the connected luxury hotel and spa open later this year. Construction of the casino resulted in more than 550,000 hours and 1,710 construction jobs in the Capital Region. Governor Cuomo’s Upstate New York Gaming and Economic Development Act of 2013 mandated that all state revenue from Rivers be directed back to the local level. Ten percent of the state’s tax revenue from the casino is split between the City of Schenectady and Schenectady County for hosting the facility, and Albany, Fulton, Montgomery, Rensselaer, Saratoga, Schoharie and Washington counties share another 10 percent. The remaining 80 percent of revenue is distributed statewide to support public education or provide tax relief to New Yorkers. In addition to creating more than 1,000 jobs during construction, Rivers has created 1,025 permanent jobs with the casino opening and will create another 50 when its hotel and spa open this summer. In addition, local governments — the City of Schenectady, school district, Schenectady County and other neighboring counties in the gaming region established by the state — will see a significant, positive, direct impact from Rivers Casino & Resort Schenectady through their share of the casino’s gaming tax payments to the state. Rivers Casino & Resort Schenectady was developed by The Galesi Group, a real estate development company headquartered in Schenectady. Founded in 1969, The Galesi Group has invested over $100 million in downtown Schenectady over the last five years. The company owns and manages a diverse real estate portfolio in excess of 11 million square feet of commercial, industrial and multi-family properties and has owned or developed over 20,000 apartments nationwide. Rivers is operated by Rush Street Gaming, which has developed and currently operates three casinos in Des Plaines, Illinois and in Pittsburgh and Philadelphia, Pennsylvania. Several Rush Street principals were involved in the development and operation of the Fallsview Casino Resort in Niagara Falls, Ontario, the most profitable casino in Canada. Rivers Casino & Resort is the hub of the 60-acre Mohawk Harbor Redevelopment Project, a waterfront mixed-use redevelopment of the decades-vacant location of American Locomotive Company, which was one of the oldest brownfield sites in the United States. The entire Mohawk Harbor redevelopment has generated more than 1.2 million construction hours equaling 2,200 construction jobs including Rivers. Combined private investment for Rivers Casino & Resort, Schenectady and Mohawk Harbor totals $480 million. Beyond the casino’s ultimate 1,075 permanent jobs, Mohawk Harbor’s commercial tenants expect to generate more than 100 additional positions. Prior to the casino referendum being approved by voters in 2013, Empire State Development invested approximately $9 million to prepare the Mohawk Harbor site and remove barriers to attract private investment in and around the site. The New York State Department of Environmental Conservation also provided brownfield tax credits to assist in remediation of the former locomotive plant. Assemblymember Angelo Santabarbara said, "This transformative project and its location not only means many good-paying jobs for the region, but also new economic development opportunities. The Mohawk Harbor site in Schenectady has now become the catalyst for additional projects in the surrounding areas, including new hotels, restaurants and many more supporting industries. With this project now complete, we are already seeing a positive impact on the local economy and the tourism landscape in the Capital Region." Assemblymember Phil Steck said, "The Rivers Casino & Resort has revitalized what was once a brownfield in downtown Schenectady. The Galesi Group spearheaded the development of an amazing facility that will bring new tax revenue to Schenectady. In fact, it has already enabled property tax relief for citizens of that City." Based on Rivers’ estimates, the resort and casino is projected to bring in 2.8 million visitors per year. In total, the four commercial casinos – del Lago, Tioga Downs, Montreign and Rivers -- when fully operational will generate $325 million in gaming taxes, of which $65 million will be directed to localities and $260 million will support public education. Rivers Casino & Resort Schenectady is located at 301 Nott Street, Schenectady, NY 12305, just off Erie Boulevard.